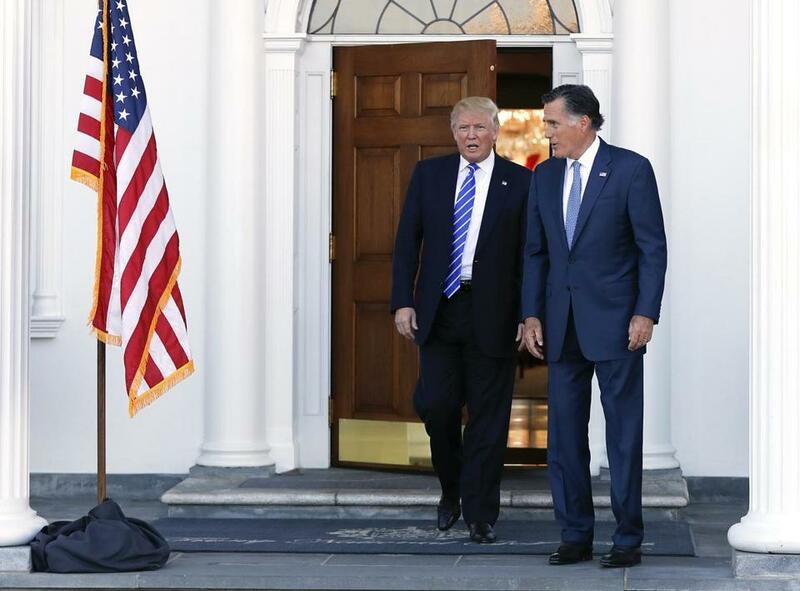 President-elect Trump and Mitt Romney walked together after Saturday’s meeting in Bedminster, N.J.
Mitt Romney had a “far-reaching conversation” with Donald Trump, Romney said after the two met at a Trump golf resort in New Jersey on Saturday. Trump cupped his hands and said “it went great” before Romney spoke. Romney’s meeting with Trump is a surprising development, given the animosity the two displayed toward each other only months ago. But Romney has been mentioned in recent days as a possible candidate for secretary of state. Romney arrived at a golf club owned by Donald Trump in Bedminster, N.J., at 12:58 p.m., according to press reports. The meeting lasted about an hour and 20 minutes. Trump and Mike Pence, the vice-president elect, were waiting at the door to the golf club. Trump clapped his hands. “Mr. President-elect, how are you, sir?” Romney said. Romney then shook hands with Pence and the three walked into the clubhouse. The meeting between the two could be a way to establish a rapport. But Senator Jeff Sessions cautioned about reading too much into the development. Sessions, a GOP senator from Alabama, is Trump’s nominee for attorney general. Trump also met with Michelle Rhee and Kevin Johnson on Saturday. Rhee is the former leader of the District of Columbia’s public schools and has been mentioned as a possible candidate for secretary of education. Kevin Johnson, Rhee’s husband, is mayor of Sacramento and a former NBA player. Later Trump met with Betsy DeVos, the former head of the Michigan GOP and another possible candidate for education secretary.